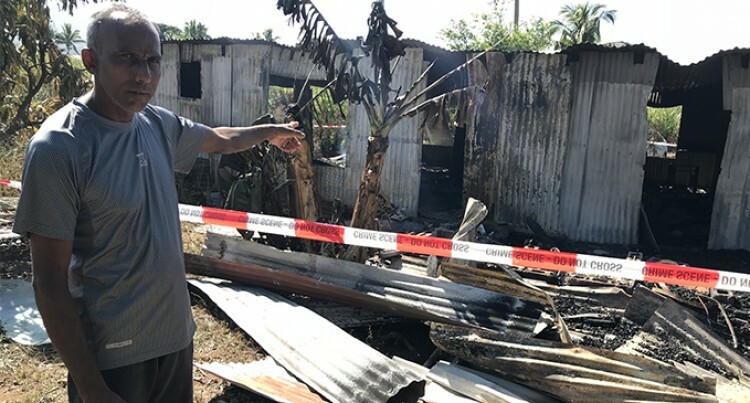 Residents of Masimasi in Sabeto, Nadi, are still reeling from shock after a house in the neighbourhood was destroyed by a fire on Monday. Rakesh Kumar, a neighbour of the family whose house was burnt, described the horror as it unfolded on Monday evening. “I’m still shocked and I cannot imagine the pain that may be caused to the house owners,” said Mr Kumar. “Nothing like this has ever happened in our community before,” he said. Mr Kumar said the house owners had migrated earlier this year to the United States of America (USA). No one was inside the house at the time of the incident. It was around 7.30pm on Monday while Mr Kumar was relaxing on his verandah when he saw smoke coming out of the house. He immediately jumped to his feet and ran to the house which is surrounded by sugarcane fields. “When I saw the house, smoke was just multiplying each second,” he said. Mr Kumar informed the Police who then contacted the firefighters. He said a family of four had been staying at the house since their childhood. To his understanding, the family had considered selling the house, but there were no buyers. His wife, Raveena Kumar, then informed the family abroad of the tragedy that had just unfolded. When contacted the daughter, Geeta Roshni, who is currently residing in New Zealand, said the news had saddened her as she had shared a lot of happy moments growing up in that home. Ms Roshni had last visited her home in May this year and re-called the joyous times the family shared. “But it’s all gone now,” she said. “We had recently furnished the house and the family was really happy about it,” she said. She said that the cost was around $15,000. She also appreciated the help of the couple who got to the scene in time. For now, Ms Roshni plans to sell the vacant land. Police spokesperson Ana Naisoro confirmed the fire incident. Ms Naisoro said the six bedroom home property of a 75-year-old woman was completely destroyed. She said that the owner is believed to have left the country for the United-States five months ago leaving the house completely vacant.